Mellow Monk's Green Tea Blog: Divorces set to skyrocket in Japan? Divorces set to skyrocket in Japan? Those in the know expect a big upswing in divorces in Japan, where a new law that's about to go into effect will allow a woman to claim up to half of her husband's pension. Demographics are also involoved. Japan's own baby boom generation is turning sixty, and this year alone about 5 million mostly male workers are expected to retire. Many have been absent spouses, working long hours and socializing nightly with coworkers. The strain of suddenly spending all day together every day after hardly spending any time together is too much for some. 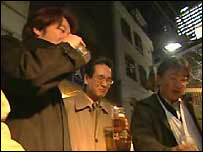 Not wanting to end up like those couples, Shuichi Amano founded the National Chauvinistic Husband's Association in 1999. "We're, uh, team-building. Right, guys?" Any horse-loving obstetricians out there? Is bottled green tea really healthy? Green tea as a tool to fight malaria? Association certifies "green tea sommeliers"